Hi, my name is Karen and I have an addiction to Diet Coke. Wow! I feel so much better just saying that! BRB - kind of thirsty . . . When I used to work full-time at a construction company I developed a bit of a coffee habit so at one point I just quit cold turkey and went water-only for a year and a half. I still don't drink coffee at home - just occasionally with friends or on trips. Oh, and in Europe, where they'll hook you up to a coffee IV if you ask. But this Diet Coke addiction is much harder to kick. Right now I don't have any Diet Coke in the fridge. I'm out. I'm also out of cereal and every ingredient for, say, a meal. It's amazing what you'll feed your family to avoid the grocery store. Can you say ramen noodles and applesauce? I knew you could! I am not, however, content to go all Hubbard's-Dog for even a day without my Diet Coke. The benefit of this, to my family, is that my loathing of the grocery store pales in comparison to my jonesin' for the DC. This normally means that the family has a peaceful mama broiling some pork chops after only a day or two of ramen and/or breakfast-food-for-dinner. Almost every day I seem to be running out to the Cookie Cupboards to get more cookies, return cookies, exchange damaged cookies, etc. And in addition to eating up any time allowance I have for grocery shopping, I'm passing drive-thru after drive-thru on my journeys. CN: And who might you be? CN: (interrupting) I don't need to know your order. I've pulled the orders. I just need your name. Yes, I actually apologized to her. Feel free to wipe your feet on me. Me: Hi, I have a case of Thin Mints to return after our booth sale last night. You told me to call by Sunday, but it was late last night when I got home and I didn't think I should call after 10 pm. CN: Look, I'm a Cookie Cupboard. (She said this like "I am BARRY EFFING GIBB!") and we keep long hours for the convenience of YOU. You should have called last night. I told you to call by Sunday because I needed to know BY SUNDAY!!! Me: Oh. OK. Sorry about that. Can I still return the mints? CN: Yes, I will take them back, just this once, but you must bring them to me TODAY! Yes, I actually apologized twice. Feel free to blow your nose on me. She even talked trash about another Cookie Cupboard while I was there, saying that the other lady wasn't able to keep up and handle her orders. It was true, but we both knew that the reason was because this other lady's daughter had started fainting at school and she was going to various doctors appointments. I give the lady a PASS on that one. Hmmm, fill orders for cookies or take my daughter to a neurologist while praying that she's not gravely ill . . . so . . .hard . . . to . . . decide. And so I think we can all agree that yesterday morning, driving home from my third emotionally-scarring experience with the CN, screamed out for a Diet Coke fix. I decided on Wendys. The cashier at the first window was a friendly (yay!) older woman. CASHIER: Aren't those Baked Lays good? I just had a bag myself a little earlier. ME: Oh, yes, they're quite tasty. Was it necessary for the nice cashier to know that I think their menu offering in the chips department is less-than-stellar? Of course not! We both left the window smiling. SMILING, Cookie Nazi. Say it with me: SMILE + ING! Stay in your garage and terrify the VITCM's, but don't you DARE go through the drive-thru at Wendys and mess with Baked-Lays-Bertha or I WILL NOT needlessly apologize the next time I see you! I mean it! Now the Large Diet Coke was a whole other comedy. The Wendy's worker handed it to me using two hands. And she was wearing wrist braces! (OK, not really) The cup was HUGE! It had a narrowed bottom part to allow for drink-holder usage, (Those Wendys engineers are SMART, YO!) but my girly hands were not large enough to span the top and allow easy lifting of the cup. Plus, it weighed about a preemie-Karl! (2 lbs, 9 ozs) I was driving down the road hoping for red lights so I could bend over and sip some nectar from the bucket. Pity me, for I know that I am pathetic. . . .were the performances of the guys on American Idol last night! I was thoroughly entertained! I particularly liked Chris Sligh, AJ and Blake, but really they were all pretty good. Maybe not Sanjaya, who I think Simon might rank lower than puppies, and Brandon, who needs to get out of his "I'm a background singer" rut, but even those two didn't scratch the surface of horrendousness that was one week ago. JOHN: Give it on up for Homelessville! I choked on my cookie. I really hope that Phil brings something more memorable to next week's show, if he makes it through. He strikes me as a really great guy and has major makeover potential. Plus I like his voice, even if Simon says it's not distinctive. I'm not saying he's my new Elliott, because there can be only one, but I'm just rooting for the guy to bring it. Elliott's album goes on sale March 20th. You can already download a single from iTunes. Atta boy! Typing up this blog post was funner than watching paint dry! No, really - I just painted all the slide mounts for the Boy Kit of the Month and had to wait for them to dry. And so . . . I get back to it! *Note* Being somewhat disturbed by Emma's train of thought there, I inquired what made her think of crushing a doctor with a really big apple. She said that she saw a picture of a doctor under an apple in one of her Franny K. Stein books. Whew. Therapy can wait until after braces! For once in my life I'm actually EARLY at something! The first March Kit of the Month from Dollar Scrapbooking is up for sale! Kristi is letting me tell all my blog friends about it before she sends out the newsletter. There's nothing to sign up for. We decided not to make this a club, at least not yet. Right now it's just an ala carte purchase system. You can preview the kits as they come available by going to Dollarscrapbooking.net and clicking on the NEW tab in the upper left. Click KIT OF THE MONTH from there. Right now you'll only see March and there will only be one kit for sale, the Girl Junk Album, but by March 1st there will be a Boy version of that kit and then every month there will be from 1-4 new kits offered for sale. They will cost $20 per kit, plus shipping. Shipping is always exact shipping, so don't be discouraged if the website estimates a high number. Kristi will adjust the charge to be exactly what it costs to ship it to you. Now the website system for Dollarscrapbooking is very strict about file size. There's a preview item for this kit on the site, but it's not very large. 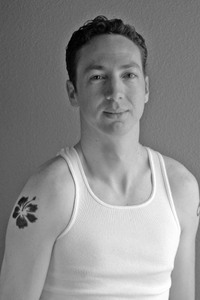 So, you can also preview kits at my website by following this link: http://www.karenburniston.com/kotm.html. 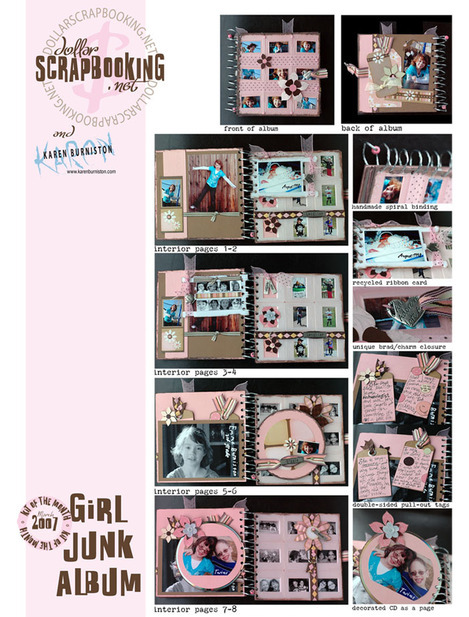 It will explain the program and provide a link to purchase the kits from Dollarscrapbooking. Honor a special little lady with a unique mini-album that you make from scratch and is also good for the environment! A ribbon card and product packaging from the kit supplies, along with an old CD that you provide, will all be re-purposed into pages and tags for this unique 6x6 junk album that is anything but junky! The kit comes will all the embellishments you will need and also includes access to the step-by-step downloadable handout, visuals and templates. TO COMPLETE THIS PROJECT YOU WILL NEED TO ADD: Pink cardstock, brown cardstock, brown paint, a CD, two beads and wire. You will also need a tool to make holes through plastic and the CD. We highly recommend a Crop-a-Dile tool from We R Memory Keepers, but a regular drill with a 3/16" bit will also work. Specific colors, quantities, sources and a complete tool list are included in the downloadable handout. When the kit comes in the mail it will include an inventory list and a unique code to allow you to download the instructions. You can then print the instructions, assemble your extras, grab your kit and tools and get to work! There are some real benefits to designing with Dollarscrapbooking's inventory. For one, it's all discontinued and overstock, so most of it is no longer available in stores and you can ONLY find some of these products at Dollarscrapbooking.net. The advantage to YOU, the customer, is that you're getting product that is worth about triple what you're being charged for it. These are meaty kits - 12-17 packaged items, plus detailed instructions and visuals for only $20. We're talking classes of a caliber that I would charge $35 or $40 for if I were teaching them in a store. The disadvantage is that we are limited to inventory on hand. We can't re-order these products, and once a kit is sold out, it is sold out. So please, if you think you want one, order it now. We have 90 of these girl kits. Now a lot of you have taken my classes before and are familiar with the style of my projects and instructions. I cannot guarantee that I'm going to incorporate interactive techniques into these kits unless they are extremely easy to create from written instructions. What I do not want is a situation where the techniques are too hard to accomplish without a physical demonstration. Happy customers = GOOD! Frustrated customers = BAD! However, my classes are always technique-heavy. In this first class, for instance, you'll be making the album from scratch including the spiral binding, which is desperately simple once you have the templates and instructions. The closure is another nifty technique. And then there's all the re-purposed junk. Four items that likely would have been thrown away become elements and pages in the album. My goal when designing classes is to give the student enough techniques and ideas to make up for any disappointment in colors or themes. Frankly, it's impossible to match the style of every potential student, so I try to design classes with "take-aways" other than the project itself; meaning ideas, techniques, templates, etc. I want a student to feel inspired to re-create the project in the style, color and theme of his/her choice. So that's my spiel! I'm very excited for this opportunity to offer classes over the web and especially when I get to work with such great products and such a hefty budget. I hope those of you who order the kit(s) will be satisfied enough to come back for more! OK, FINE! I can't spell! Look, I did spell-check and it didn't recognize "chachkis" but I thought that was because it was Yiddish. Typepad also doesn't recognize "Heh" but do I let that stop me? Please tell me that I spelled "raspberry" correctly. And to my dear brother-in-law Randy: Joannie loved CHACHI, not tchotchkes! Actually, she may have loved tchotchkes. I don't really remember what their apartment looked like. I was too focused on her hair. *I* loved Chachi but that's a whole other post. He could have been Charles in charge of me. I'm just sayin'. Rats. Now I have the theme song to Charles in Charge in my head. Charles in charge of our days and our nights. Charles in charge of our wrongs and our rights. And I sing . . . I want, I want Charles in charge of me! And that's my little present to you, Cagney and Lacey of the Spelling Police . . . mess with me again and I'll lay an Oscar Meyer or Band-aid commercial on you. Don't make me prove it! Just when I thought I was going to be oh-so-regular with my blog updates I had an attack of life again. Dr. McMeltme decided that the wait was over. Her permanent teeth were stuck behind baby teeth and one was digging in so hard that she was developing an abscess. 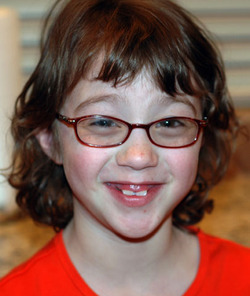 He ordered six of her upper baby teeth to be removed, pronto! From there it was a series of phone calls to our dentist, to the oral surgeon who had a policy of not seeing patients under the age of 10, back to the dentist, back to the surgeon until it was finally determined that the surgeon would waive his "under-10" policy and pull her teeth on Friday. When I looked at the teeth in the envelope though . . . oooh, that was a near-fainting experience. Two of the front ones were obviously close to coming out anyway. They looked like typical baby teeth when they fall out. You know . . . cute and rootless. The second two were more wicked - had roots about a quarter-inch long. The molars, though - oh my gosh! They looked like Monique's teeth from Desperate Housewives! To think about Emma having holes the size of those roots in her mouth . . . ewwwww! I made her a milkshake . The tooth fairy brought her a fortune. She got to watch a lot of Scooby Doo! So between caring for my chipmunk and being busy as the TCM (Troop Cookie Manager . . .we're very important!) and getting all the logos and instructions and mail merging done for the Kit of the Month club that will launch Friday/Saturday-ish, and watching an insane amount of new TV (still a Romber fan, I must say) I found no time for blogging. But I did shop for chachkis! I have this new kitchen, see. And I have this new dining room furniture sitting on a fancy wood floor, but I'm not much of a decorator. And by "not much" I mean "really lousy". I never know what to hang on the walls so I end up hanging nothing. And my chachkis consist primarily of items that I won at Pokeno many, many years ago. My friend Sharon hired a decorator. I was jealous at first, but then when I saw the finished results I was no longer jealous. More like INSANELY JEALOUS!!! All of her chachkis are cohesive and interesting. There's a variety of materials and textures. And heights. 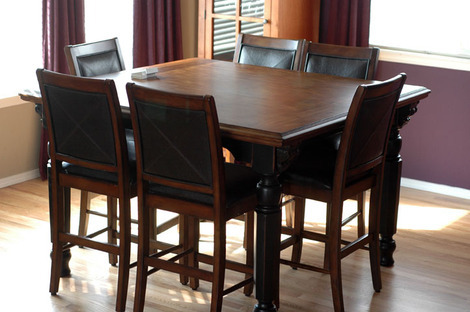 And don't EVEN get me started on how nice the furniture is arranged or that new light fixture over the kitchen table. I might just have to tear a clump of her hair out at the roots. Becky: It would KILL me to write a check for something like that. Me: You wouldn't pay a decorator? Becky: Not even if he was wearing a suit made out of Justin Timberlake! OK, she didn't say that. It was a line from one of my new favorite shows "Rules of Engagement". Love me some Putty. Kronk's got his new groove on! But I digress . . .
Becky doesn't need a decorator because she's got the chachki gift. She has wooden skis hung criss-crossed on the wall over the piano, for goodness' sake. Who thinks of that?! I'll tell you who - a person gifted in the fine art of chachkis and wall art, that's who. See the variety of heights and textures? That's good, right? And see how the candle stand mirrors the curly wrought iron of the plate stand? Repetition, good. There's even swirlage on the kiln-fired vase (make sure you pronounce that VAHze when you read it, 'kay?) 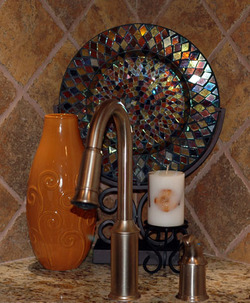 I'm sure a professional would vomit in my sink, but I'm digging this grouping, especially when the under-cabinet lighting reflects the colors of the mosaic plate. And so this minor success (and if you think otherwise, please keep it to yourself and revel in your chachki goddessness while laughing behind my back, thank you very much) led me, bewilderingly, to think that I was qualified to arrange fake greenery in a wide-mouthed vasey urn thing that I think looks more like a trash can than a vase, but John digs it. 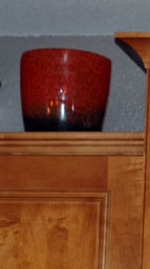 This wide-mouthed vasey urn thing that looks more like a trash can is currently on top of a kitchen cabinet, looking rather empty, if I'm being honest. There isn't much clearance, so I thought perhaps if I arranged some hanging greenery it would look better. I had a Michaels coupon, after all. But I was a bit of a lost puppy in the floral department of Michaels. It's like they just EXPECT you to know what you're looking for! After wandering around aimlessly I finally picked out two clumps of some green stuff that said it was Chinese something. It stuck straight up, which maybe should have been a clue, but I had a grand plan to bend all the stalks over the side of the wide-mouthed vasey urn thing that looks more like a trash can and thought (in my head) that it would look quite lovely. I even thought to buy one of those styrofoam wafers to hold the stalks. I'm no decorator but I understand the laws of physics. So there's that. I had one of the clumps stuck down tight in the styrofoam wafer, all arranged and bent over the sides of the wide-mouthed vasey urn thing, and back up on the cabinet when Emma walked in. Me: Hi Emma! What do you think of this? Emma: It looks like a dead plant. Except that it's not yellow. Me: Oh. Yeah, I guess with the stalks all folded over it does sort of resemble . . .
Emma: (interjecting as she picks up the other clump from the kitchen counter) Hey! This one looks alive! So, uh, yeah. I'm not good with greenery. And did any of you fellow fans quote The Princess Bride during Grey's Anatomy? She was only "mostly dead". Heh. Denny was looking HOT! A shame that he's all dead and all. No real way to bring him back unless maybe each of the main characters, in between hooking up with each of the other main characters, has a near-death experience. I was just glad that Merideth, while visiting the afterlife, didn't meet a kid she tortured in middle school who would proceed to pummel her until I ran screaming from the theater. Oh wait, that was Flatliners. I think it's time to sleep! 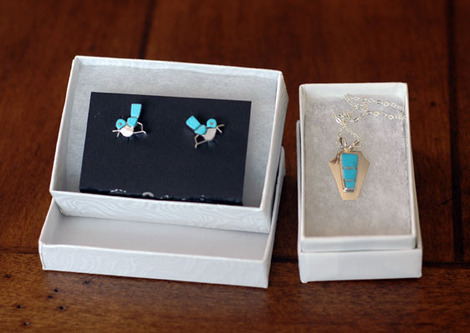 If you give a girl some earrings . . .
. . . she's going to figure out that the pendant she came across in the key cabinet was meant to be found after all. And if she figures out that the pendant and the earrings were meant to be discovered, she's just going to go "Awwww!" and think about her thoughtful husband who is particularly good at "hiding" pieces of jewelry where they are meant to be found, like in the key cabinet and the dashboard of the van. And if she thinks about her thoughtful husband, even while driving down the road leading a caravan of two other people recruited to help pick up Girl Scout cookies, she's going to want to call her husband right away to thank him. And if she's driving after a night of snow then all of the lane dividers and street markings are going to be covered, so she'll have to just follow the tire tracks of whoever was the first one to drive down the street and thereby decide for everyone where the lane should be. And if she comes up to a shopping center and realizes that the "lane" she's in is actually a turn lane she'll have to get over one. And this might be difficult while talking on the phone and she'll also have to check out her rear view mirror to make sure that her caravan is also getting over. And if it snowed there's probably a bunch of sand/gravel mixture in the intersection. And she will, after all, be talking on the phone. So she might not notice a trifle like a red light. And she'll have to slam on her brakes. And she'll slide on the gravel slightly into the intersection but not enough to hit the turning car who has the green light. Not even close, really, but scary nonetheless. And the turning car driver is going to be mad. And the turning car driver will notice that gravel sliding driver is on the phone. And the turning car driver will notice her smiling and not realize that it's because she feels very embarrassed, stupid and lucky. The turning car driver will not be able to hear her tell her husband that she really must get off the phone and stop being a poster-child for a distracted-driver brochure and the turning car driver will instead think that she's an arrogant smiling idiot with a cell phone who doesn't realize that she could KILL someone with that attitude. And so the turning car driver will honk. Profusely. And the car behind the turning car driver will honk in support. And the girl with the earrings will sink down in her seat a little and attempt to put more "sheepishness" into her smile but it probably won't stop the honking. And she'll also have to explain to her caravan why she did that very stupid thing on the way to pick up Girl Scout cookies. "The bird earrings are cool, but nobody ever notices earrings so I had to get you a pendant to match." "Oh, so that people will notice the pendant and I can say 'Yes, but check out the matching earrings!''?" She's going to see a lot of humor in the fact that her husband is such an expert on how women get their earrings noticed and she's probably going to blog about it. And after she blogs about it she'll probably head out to the store to find a gift for her thoughtful husband with the tattoos and the earring sense. And if she goes to the mall on Valentines day she's probably going to see a lot of jewelry. And if she falls in love with a bracelet she's going to have to buy it. And if she buys the bracelet . . .
She's just going to want some earrings! Why yes, I did fall off the edge of the earth. I'm clumsy that way. Apologies. Like ships that pass in the night, John and I have been criss-crossing our travels, each of us getting enough taste of single parenthood to convince us never to try it long term. But, at long last, we are both home for a while. And that's a good thing. Or it *would* be a good thing if our home were neat and orderly, but I find that when I'm catapulting through space, having just fallen from the edge of the earth, it's hard to run the vacuum. So while my vacuum's getting dusty . . .
And, side note, how does one clean a dusty vacuum cleaner? You see the irony? It's like trying to throw away a trash can. I've been working. CHA brought some new opportunities, which is always a good thing, and I've been attacking those opportunities with fervor. A "kitchen-poor fervor" if you will. And I'm a kick-booty multi-tasker, it has been said. I can unload the dishwasher and quiz a kid on spelling words while macaroni is boiling on the dual-fuel professional-series range (that would spit on my macaroni-filled pots if it had lips and saliva glands). I can even fold socks while I watch Survivor. True story. But, unfortunately for the house and family, the only multi-tasking I can muster while I'm working on a class or product is to shovel snacks into my pie hole and drink way too much Diet Coke. Today I'm trying a different combination called "less snacks, more blogging", but even that slight variation won't improve the deplorable state of the family room bookcase or the horror film that is the kids' bathroom. Yesterday I discovered, quite by accident after a chachki shove, that my living room end tables are actually brown and not "dusty brown". Who knew? And so I hope you will forgive me for not putting the proper level of thought and wit into this post. I have simply scads of tasking to do. Multiple tasks. Tasking by the ton. Or something. I'll be working with Dollarscrapbooking.net again this year running the booth at several conventions. My first show is CKC Portland in March. As always, I'm looking for workers for the booth, although this particular show I've filled several of the spots with workers from last year. Here's what I have left: Thursday set-up, 11-5, and Friday booth help 8-3. Pay is $10 an hour or 20 dollar-items per hour. You can mix and match your pay. Admission to the show, lunch and parking reimbursement is included. Simply post a comment or e-mail me if you're interested in either (or both) of those shifts. Speaking of the new inventory, we are finally ready to launch some kits. I will be designing the projects and instructions and you will be able to order a new kit each month at Dollarscrapbooking.net. Look for the first kit to be online within the next couple of weeks. It's one of the things I've been working on this week. all day. I'll teach my three interactive Creative Imaginations classes (Wild Side, Transparency Techniques and Memory Art) that can be viewed on karenburniston.com. Call the store for more information about cost and times if you're interested. A list of what to bring is under the description of each class. These are technique classes where you will receive extra templates for the interactive features, so consider coming for the techniques alone, even if you're not sure you'll use the specific projects. All righty then! I think I covered everything that I'm allowed to talk about, (Yes, that was purposely cryptic) so I best be getting back to tasking! So this is a PS to the post below, called The CHA Diaries. If you're just joining us you really ought to scroll down and read that one first so this one makes sense. You do as you please, but I'm just sayin'. Is that a FLOWER? on his right shoulder? Great stories as always - more - more - more! Why yes, Michelle, that IS a flower. A hibiscus flower to be exact. He loves the hibiscus, which represents his Hawaiian heritage, and is, let's be honest, one of the more, er *cough* MASCULINE *cough* flowers. winkwink nudgenudge knowwhatimean? JOHN: So?! Did you get lots of comments? Do I have a lot of fans? ME: Why yes! Cheryl thinks you should not be called Couch-John but rather HUNK-John. ME: And Michelle asked whether that was a FLOWER on your shoulder. I'll probably respond that yes, it's a flower, but if you squint it looks like a skull and crossbones. JOHN: Or you could just tell her that I have a bigger tattoo on my back of an eagle with a dead pig in its talons flying over a battleship. Plus he can impersonate a panther!